In the culmination of many rumors circulating over the past month — and a statement from IWF President Dr. Tamas Ajan while visiting Iran for the Fajr Cup — the International Weightlifting Federation (IWF) has finally released their official announcement on the London retests: 10 weightlifters from the 2012 Games had samples test positive after retests, and they have already received mandatory provisional suspensions. The lifters implicated include five champions from the 2012 London Olympics. And to the dismay of weightlifting fans worldwide, one of those lifters is Kazakhstan’s Ilya Ilyin, who also won gold at the 2008 Beijing Games. The full list of lifters who received suspensions after the London retest is below. The International Olympic Committee (IOC) conducted the reanalyses. Their cases are not officially closed yet, and the athletes can appeal the decisions. 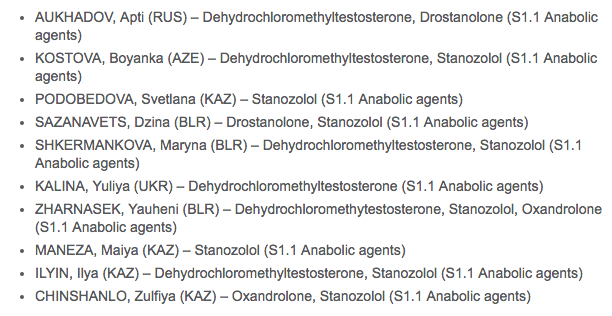 Each of the lifters in the disclosure tested positive for an anabolic agent. The full list of positives and the substances detected are listed below in a screenshot from the IWF disclosure. While there is an appeals process in place, it’s not a short procedure. It’s likely each of these athletes will be barred from competing in the 2016 Rio Olympic Games, and if the test results are upheld, they’ll receive competition bans of at least two years each. The IWF has also announced retesting of samples from Beijing but has yet to release the results. Sources indicate ten lifters from Beijing have also come up positive during the retests from that iteration of the Olympic Games. We’ll update this article regularly as more information emerges.